If you like yogurt you are going to love this simple recipe I found in Prevention Magazine that my friend Mike let me borrow. Time always seems to be an issue when it comes to preparing healthy meals. Sometimes I hit it out of the park and other days it’s Dominos. For the most part I do a pretty good job and having Dominos every now and then isn’t a bad thing. I love yogurt and I’ve tried countless brands. Most of them are loaded with sugar and are okay but not great. I really don’t like the gelled fruit on the bottom, often settling for the fruit flavored. When I came across this recipe I just had to try it because I could control how much “stuff” goes into “my” yogurt. I will clearly say once you do this, you may never buy a “prepared” yogurt again. I’m acting like I just found the Ark of the Covenant. I know this is old news, but this was really good, easy to prepare and tailored to your individual taste. Sauté the frozen pineapple, honey and cinnamon over medium heat for 3-5 minutes. Allow to cool. Place the pineapple on the yogurt, garnish with the nuts and Walla! You’re done! If you are using fruits with more fiber I you could use fresh fruit. You could even use fruit like raspberries, just don’t cook until soupy or maybe do if that’s what you like. I found using the frozen fruit took a little more than 3-5 minutes. I can see taking the fruit out 30 minuets before and making the recipe or just cook it a little longer. I tend to like a little caramelization on mine so I let it Sauté for about 8 minutes. I couldn’t find any raw pistachios so I used lightly salted and roasted nuts. This really sent this over the top. The crunch and saltiness of the nuts played well with the fruit and the plain yogurt. You can sauté the fruit the night before and assemble in the morning before work/day. Enjoy! Happy Miles to You!! 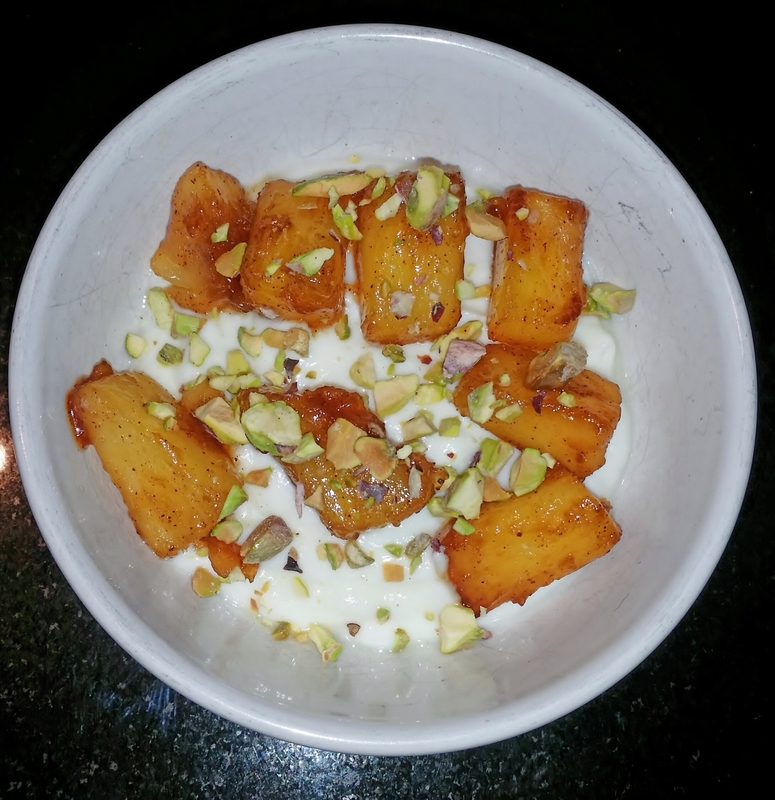 This entry was posted in Eat, January ~ 2015 and tagged eat, Health, yogurt. Bookmark the permalink.